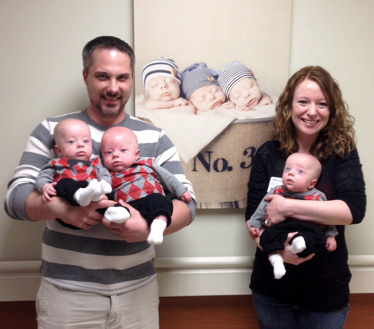 Meet the family of Becky and James Asher, who delivered their triplet babies with Kansas City ObGyn in July 2013. We followed up mom Becky to find out how the babies and family are doing. Kansas City ObGyn: Which physicians delivered your babies? Becky Asher: Dr. Nichols with Dr. Arroyo assisting. I was bummed that my doctor, Dr. Newby, was out of town and couldn’t be there because I loved her! However, Dr. Nichols and Dr. Arroyo did a fabulous job. KCO: How was your experience? Becky: Dr. Nichols and Dr. Arroyo were both outstanding. My nurse, Amber, was also great. She took some pictures for us in the delivery room that I will always cherish. We had a team of almost 20 people in there, as each baby had its own set of support staff. Our boys were born on the “4th of July night” (though it was actually July 5th because it was after midnight). But I very vividly remember one of the respiratory therapists, I think his name was Rusty, being decked out in American flag scrubs and thinking it was pretty awesome! Meet the Balwanz family, Joanie and Josh, who delivered their twin babies with Kansas City ObGyn on September 30, 2016. We followed up mom Joanie to find out how the babies are doing now. Kansas City ObGyn: Which physician delivered your babies? Joanie: Dr. Heit delivered my baby girls. Joanie: We loved Dr. Heit. From day one, he made us feel so comfortable. He treated me as if I was his own family, and I felt he made decisions that put my and my twins’ safety first. He explained things well to my husband and me always, and never made us feel anxious about the pregnancy or birth. We always felt that he took his time during our doctor visits, and would recommend him highly! KCO: Did anyone else who helped deliver your babies stand out to you? Joanie: We had an excellent experience from he moment we were admitted to the hospital. From the nursing staff and on, we felt well taken care of. As far as prior to the delivery, Kim the sonographer at Kansas City ObGyn was outstanding. She took her time and explained things well that were going on through the developmental stages of the pregnancy. She was a lifesaver. Preterm labor occurs when the contractions begin before the 37th week of pregnancy. Along with contractions, changes in the cervix occur which signal labor is beginning. The cervix begins to thin, a process called effacement, and it starts to dilate so that the baby can enter the birth canal. Normal pregnancies last around 40 weeks, so any labor that starts before then is called early labor or preterm labor. Meet the Martin family, Sarah and AJ, who delivered their twin babies with Kansas City ObGyn on November 8, 2015. We followed up mom Sarah to find out how the babies and family are doing. Sarah Martin: Dr. Nichols has been my OB/GYN for about nine years and she was the doctor who delivered my twins via C-section. However, because it was twins, they had to have two obstetricians in the operating room, so Dr. Newby also helped deliver them. Sarah: Awesome! I seriously cannot say enough good things about Dr. Nichols! I just love her! Since I was having multiples, I had more frequent check-ups and sonograms throughout my pregnancy, and it was always so enjoyable to see Dr. Nichols and catch up and ask her my list of questions I always had. We found out we were pregnant at five weeks, and around seven weeks on a Sunday before my first obstetrician visit, I started bleeding. Fortunately having never experienced infertility or miscarriage, I was shocked and assuming the worst. The office got me in early the next morning for a sonogram and that is where we got the surprise of our lives. We hadn’t lost a heartbeat, we had gained two of them! So then they fit us in for an obstetrician appointment with Dr. Nichols that morning and just laughing with her about our state of shock and what was to come made it all seem less scary. Even though I know Dr. Nichols and all the other great staff at the office are so busy, I never felt rushed or like she was trying to hurry my visit. We chatted about life and laughed and went over any questions or concerns I had. She helped me be at ease through my pregnancy and also prepared me for the scheduled C-section, so once that day came, I was not apprehensive at all. She’s just a truly great physician! Samantha: We loved Dr. Arroyo. 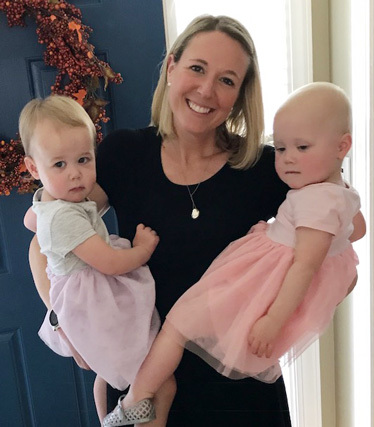 We were patients of Dr. Brabec’s at Reproductive Resource Center, as our kiddos were conceived through IVF, and we were worried about transitioning from seeing Dr. Brabec’s office often to being regular patients at our obstetrician’s office. Dr. Arroyo made me feel so comfortable during my pregnancy. He never made me feel rushed during our appointments, talked me through all of my concerns, and made sure I knew what to expect during the next weeks. He was also extremely calming during my delivery when I was anything but calm! KCO: Did anyone else at the office stand out during your pregnancy and delivery? Samantha: The nursing staff at Overland Park Regional was absolutely amazing. We checked in Wednesday, July 6 for induction and didn’t end up having the babies until late Friday night and early Saturday morning, so we went through multiple shift changes. The anesthesiologist staff was also amazing. My daughter was born first and was having some trouble with her breathing initially. My husband kept going back and forth between being with me and being with our daughter as the respiratory therapist came down from the NICU. Once it was clear that I would require a C-section for my son I got extremely nervous. The anesthesiologist stepped in and was extremely calming for me while they got me prepped and my husband was by our daughter’s side. Why should I do a monthly self-breast exam? A monthly self-breast exam (SBE) is part of a three-part breast health arsenal every woman needs to use to be on guard against breast cancer. The SBE is an inspection of your breasts to increase your awareness of how they look and feel when you are in good health so that you can report any changes or concerns to your doctor. Monthly self-exams also let you take action to help protect yourself against cysts, cancers and infections that affect the breasts. Monthly self-exams let women be more comfortable with their bodies, and able to provide vital information to their doctors at their yearly physical exams. 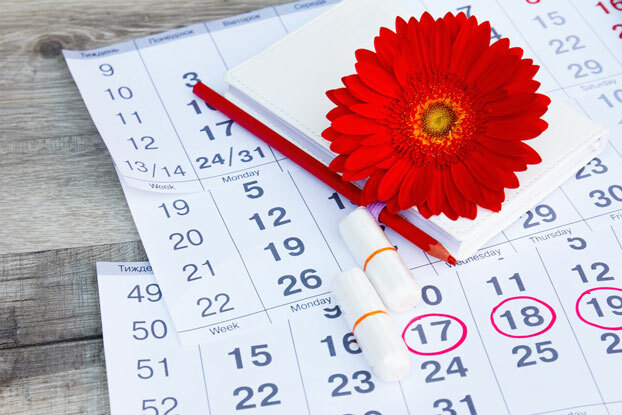 The monthly BSE should be done along with annual clinical breast exams at the doctor’s office and mammograms according to the recommended schedule. Up to 40 percent of breast cancers are initially detected by women who felt a lump at home during a self-exam, according to Johns Hopkins Medical Center. 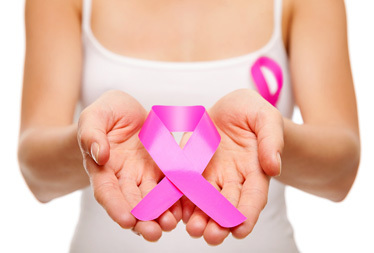 Clinical breast exams and mammograms help diagnose the nature of lumps and other abnormalities, and they are the other two vital parts of the three-part breast health arsenal. Women should become familiar with the look and feel of their breasts, and report any changes or concerns immediately to their doctors. Most changes women note at home are eventually determined to be benign, but some changes do indicate something more serious is happening. Early detection of a problem is the key to successful resolution. 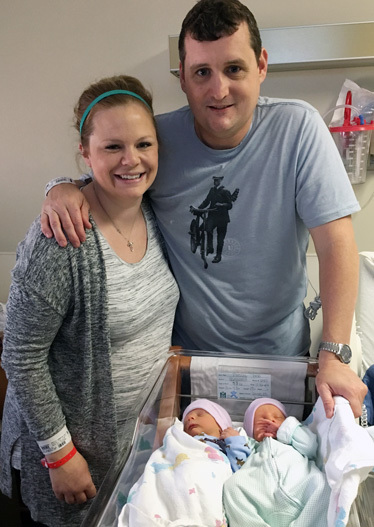 Meet the family of Kristin and John Lovell, who delivered their twin babies with Kansas City ObGyn on December 18, 2014. We followed up mom Kristin to find out how the babies and family are doing. KCO: Which physicians delivered your babies? Kristin Lovell: Dr. Arroyo, my obstetrician, and Dr. Newby delivered our baby girls via C-section. They were amazing! They both were very calm and did a great job of explaining what was happening, what was next and how I might feel. My husband recorded the entire birth and we cherish it so much. We can’t wait to show our girls one day. Dr. Arroyo was awesome during my entire pregnancy experience. This was my first pregnancy and I had no clue what I was doing. He was resourceful, honest, calming and always so pleasant! We used a fertility clinic out-of-state and he was open and accepting to work with them throughout the pregnancy. We had so many ultrasounds I lost count because we were pregnant via in-vitro fertilization and had twins. We really got to know Kim, the ultrasound tech. She’s down to earth and fun, which made the experience that much better. She’s really great at her job; even our IVF clinic commented on the attention to detail of our ultrasound pics - you could clearly see hands and toes! 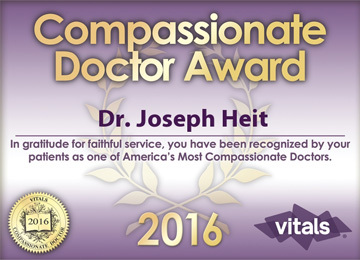 Dr. Joseph Anthony Heit of Kansas City ObGyn in Overland Park, KS has earned the prestigious 2016 Vitals Compassionate Doctor Award. The award recognizes doctors who treat patients - not just conditions - with care and grace. In a recent Vitals Index survey, one of three respondents said that a doctor who “listens and spends time” with them was the most important quality indicator. Research shows that the better the patient experience, the better the clinical outcome. That’s because patients who trust their doctor are more likely to adhere to a physician’s advice and take prescribed medications according to schedule. Compassionate Doctor award winners are chosen based on the number of reviews a doctor receives from patients for the calendar year and minimum rating values. The algorithm also takes into account other quality metrics that the provider must meet. With nearly eight million ratings and reviews, Vitals has the largest collection of crowdsourced data on doctors than any other online site. 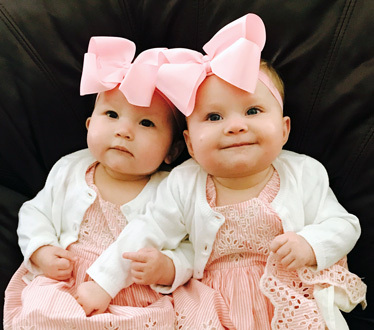 One of the many families of multiples who have passed through the Kansas City ObGyn office is the family of Renee and Ben Laster, who delivered their babies on the morning of July 4, 2016. We followed up mom Renee to find out how the babies and family are doing. KCO: Which physician delivered your babies? 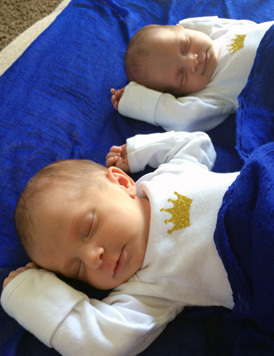 Renee Laster: Dr. Heit delivered our twins, but Dr. Arroyo is my regular doctor. Since our girls were born the morning of July 4th, my husband's tee time was cancelled, Dr. Heit came straight from the golf course, and Dr. Arroyo was golfing too far away to make it to their birth in time. 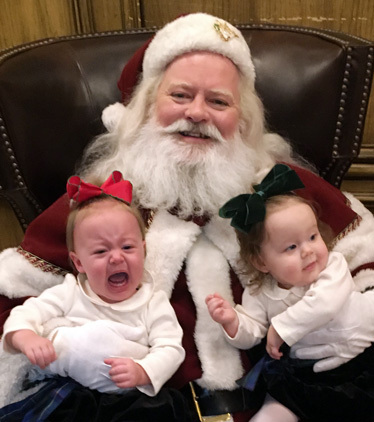 Two little girls cancelled two golf games that day - the first of many for their dad! Renee: Our experience with the Kansas City ObGyn doctors was top notch! Dr. Arroyo was extremely positive and supportive throughout my entire pregnancy while providing the most sound medical advice. My favorite thing about Dr. Arroyo is how calm he is. Babies come with a lot of hoopla, but Dr. Arroyo can shut all of that out. Dr. Heit provided wonderful delivery and labor advice during what was a very overwhelming day. I had not planned on delivering my twins via C-section, but our “Baby B” was breech. I had spent most of my pregnancy planning (ha!) on a vaginal birth. If I chose to deliver vaginally I ran the risk of laboring for who knows how long for “Baby A,” and then having a C-section for “Baby B” if they were unable to flip her. I was so overwhelmed with needing to make a timely decision in triage that I was crying. My husband was helping me weigh our risks, but it was ultimately my choice (smart man). When Dr. Heit said to me, “If you were my daughter, I would advise you not to take the risk of a vaginal birth and go with a C-section.” That was all he had to say, my mind was made up - C-section it was! Dr. Heit told me after the C-section that “Baby B” would have been nearly impossible to flip and that I'd made the right decision. I reminded him that it was his expert advice that had lead me to that good decision. Dr. Arroyo kept me and my babies healthy for nine months and Dr. Heit finished the job with a smooth and healthy delivery. According to the Mayo Clinic, amenorrhea (pronounced uh-men-o-REE-uh) is the absence of menstruation or missing at least one menstrual period. This includes girls who have not begun having periods by age 15, as well as women who miss at least three periods in a row after having normal menstrual cycles. Women may be more at risk of amenorrhea if they have a family history of it, if they have an eating disorder, or if they participate in strenuous athletic training. According to the American Society for Reproductive Medicine, pregnancy is the primary cause of amenorrhea. Other normal life events such as breastfeeding and menopause also cause amenorrhea. Approximately three to four percent of women will experience amenorrhea from other cause during their lifetime.